Quinta do Fim is a traditional country house with wonderful views of the river Dão. The interior is full of atmosphere. 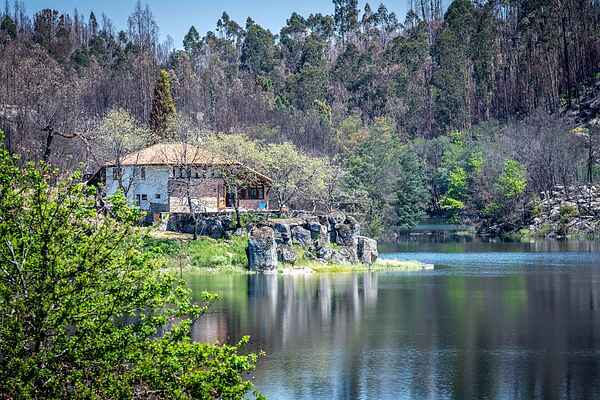 The holiday home lies in a quiet area amidst beautiful scenery, around 3 km from Treixedo. The house sits on a rock and enjoys a superb view of the area from the veranda. Quinta do Fim is in a valley of 5 hectares with olive trees and a small beach by the river. There is a 1933 irrigation reservoir at the bottom of the rock. This has been converted to a small swimming pool of around 4m x 5m. It is 1 metre deep. A car is recommended (not a too low car because the last kilometer of the road is not asphalted). Santa Comba Dão is 6 km away and Tondela is 10 km with shops, restaurants and pavement cafes. The attractive city of Viseu is 30 km. The city of Coimbra is 50 km. It is Portugals 3rd city and well worth a visit. There are a variety of activities available such as walking, hiking, cycling and canoeing. Regional websites: http://www.freewebs.com/treixedo/index.htm (visita 1) http://www.cm-santacombadao.pt The last 800 yards of the itinerary will be paved within a few years as the former railroad, that the house is situated along, will become part of the official bicycle route Ecopista. Google Earth, Search: "Treixedo, Portugal", Layers: check Primary database, Geographic web, Panoramio.